One of Ohio’s top birding sites, Wendy Park’s 22 acres of green space on the edge of downtown Cleveland makes it a vital haven for wildlife. Boasting a remarkable 260 species of birds recorded on site, birders, photographers and nature lovers are drawn to this dynamic landscape. Wendy Park offers crucial habitat for nesting and migratory animals–including extraordinary monarch butterflies in the fall. 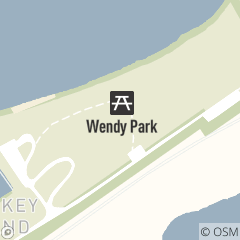 Wendy Park features a natural surface kayak launch. League Play is Sunday through Thursday nights, 5-11p.m. Courts are first come first serve otherwise. For large groups, advance reservation is recommended. Discover Cleveland from the seat of a sit-on-top kayak. Get to know the beauty of Lake Erie while you experience a sunset SUP tour.